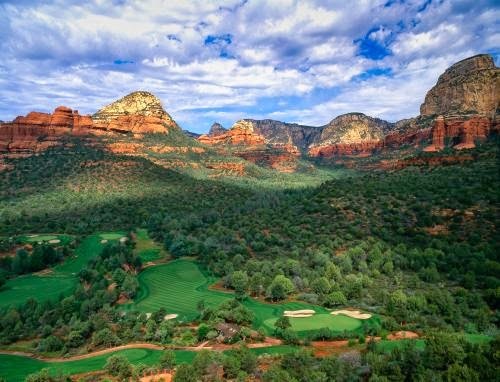 Seven Canyons in Sedona AZ, just 100 miles north of Phoenix was built in 2003 when golf course developments were booming. It is completely surrounded by 100,000 acres of Coconino National Forest and Red Rock Secret Mountain Wilderness. It is a good golf course neatly squeezed into a jaw dropping setting. 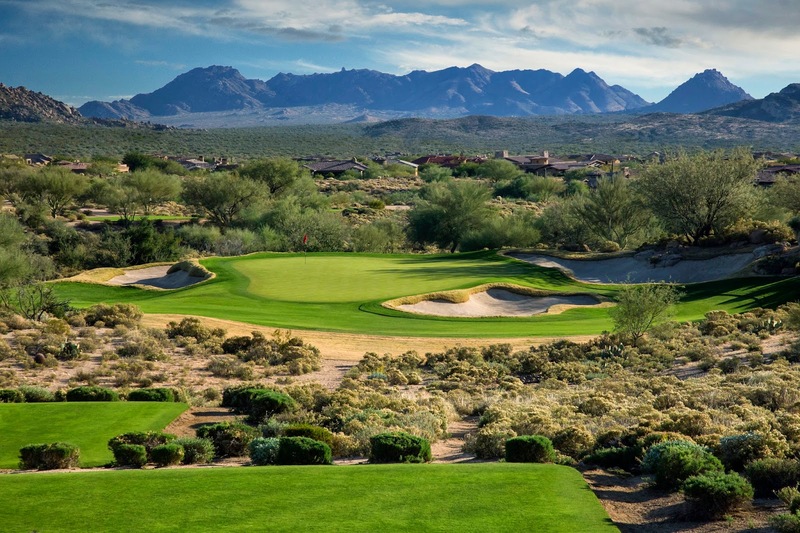 If you are looking for Arizona desert golf, then head back to Phoenix because here you are among the Red Rocks, Canyon Walls, Chaparral and Pondorosa Pines and water falls. How a private real estate development came to be inside of a National Forest is a good question that I don't have an answer to. We are at 4600 feet above sea level, well above Phoenix, but that will vary today as there is over 300 feet of elevation change here at Seven Canyons. And be sure to bring your greatest concentration because its easy to be completely distracted by the beautiful red rocks landscape where you are spending your day. Oh yeah! I almost forgot I have to hit another golf shot. The 175 foot drop from the tee to the par 3 fourth green not only confounds you about what club to select but makes you think they should just provide a zipline down to the green. In 2003 it was developed as a private club with luxurious fractional share villas to be sold. But the recession hit and it fell on hard times. Now homes are being built again and a brand new clubhouse will open in April of this year. Enchantment Resort recently took over management of the club. The service here was terrific and the course was in wonderful shape. The scenery on the driving range alone makes you want to stay and hit just a few more practice shots. While there are still private club members, you can play here if you are staying at Enchantment Resort. And believe me staying here isn't exactly tough duty. Its Five star luxury all the way in an awesome setting. I don't think there is anything else quite like it in Sedona. It stands at the doorway to Boynton Canyon and every view is its own inspiration. The food is wonderful, there are plenty of spa services and the service is impeccable. We are in a Casita Jr suite and tomorrow morning we will get up and participate in morning yoga.— We told some friends in Phoenix we were coming here. They used to live in Sedona. 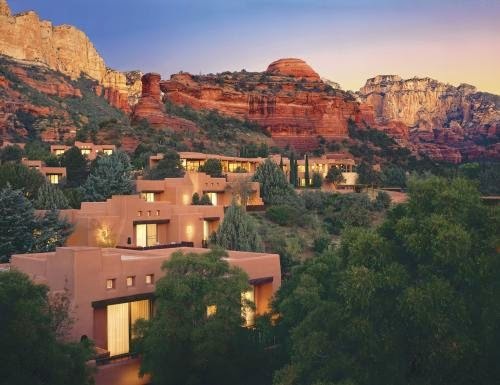 They told us the biggest factor in their decision to move to Sedona was staying at Enchantment— its just drop dead gorgeous. Mirabel, in North Scottsdale, AZ is big in every sense. From the clubhouse to the service, to the golf course, Mirabel comes up large. The clubhouse is ultra comfortable, perfect for before and after, and the staff leaves no stone unturned to make sure you’re happy. The practice area has extensive targets and the practice balls are Titelist Pro v1’s but the fun really begins on the first tee. Tom Fazio, Mirabel’s designer, has more golf courses on the Top 100 than any living golf course architect. Mirabel is one of his Arizona masterpieces—7141 yards of glorious golf that displays all of Fazio’s trademark design elements, all big. It begins with the fairways. Fazio is known for creating generous landing areas and he does not disappoint here at Mirabel. The fairways are wide—60 yards and more at the par four 15th, and more than ample elsewhere. Large landing areas leaves plenty of room for undulation so good luck getting a flat lie. You know you ought to hit them, and Fazio thinks you should too. That is why he lined them with vast bunkers that you may dream about—or have nightmares about depending on how your day goes. And then there are the greens, where big becomes really big. Fifty to seventy-five foot putts are almost always a possibility, and they are complicated by ridges and more subtle rolls that can make two putts a real challenge. The greens are running at 10.5 on the stimpmeter today but as the asst golf pro pointed out. “Pay attention to where Phoenix is on all your putts. If you are putting down valley 10.5 may become 12.5 and if you are putting up valley, it may become 8. But don’t worry—big fairways, big traps and big greens add up to a very playable course, especially if you choose the right tees. You can hit most of the fairways, you can get your second shots into the vicinity of most of the greens. Getting in the hole from there is where the real fun is. These greens are fiercely guarded and they all have more than enough movement in them to keep your full attention. Polish up your short game and you’ll have a lot of success. This type of design is one of Fazios strengths, fun for the Sunday golfer and a challenge for the single digit handicapper. If you came for the views, then you have come to the right place. We are at 3,000 feet above sea level with expansive views of the valley below. Take number three tee box for example— we can see all the way to downtown Phoenix and even to Univ of Phoenix stadium, where the Superbowl was played yesterday. If that view isn't expansive enough the tee box at number six should be, as it is the highest on the course. On number ten we finally see water in play and it will be the first and last time that we see that today. Mirabl is member owned and operated and appears to be on solid financial footing these days. They have reduced the maximum membership from 350 to 275. In the past you had to own property to be a member here, but that is no longer the case.